This means that the tooth was prevented from coming through to the dental arch correctly by bone, fibrous tissue or another tooth. Because the upper canine teeth are some of the last to come through, they have more potential to become impacted. Is it common to have impacted canines? About 2% of the population have an impacted upper canine, usually affecting one side only. Most of these impacted canines present themselves towards the roof of the mouth (the 'palate') but some impact towards the cheek. A variety of factors can reduce the space available for a canine to come through, contributing to it becoming impacted. Commonly, there may already be a degree of teeth crowding in the upper jaw due to a shortage of space. In some cases, there is a genetic history of canines being impacted. If the canine is left in its impacted position, a cyst can develop around the crown of the impacted tooth, which can become infected and can also cause damage by putting pressure on adjacent teeth. Surgical Exposure of impacted canine is usually part of a course of orthodontic treatment and so you should seek the advice of your orthodontist regarding your particular circumstances. How will the tooth be exposed? First, x-ray films are used to locate the position of the canine. 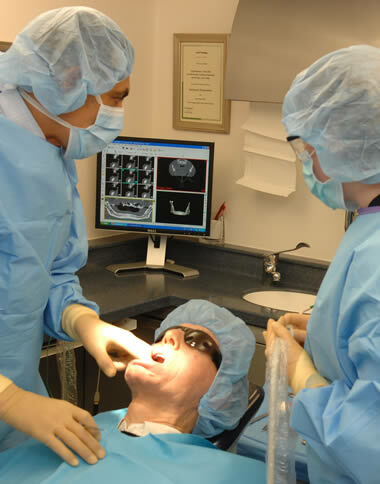 The overlying tissues are then surgically raised away from the tooth to allow for sufficient soft tissue and bone removal to expose the tooth adequately. Stitches are used to put the raised tissue back in place (these are usually dissolvable). A healing pack is then placed over the exposed tooth and non-dissolvable stitches may be used to secure this. The pack and stitches are quick and easy to remove and an appointment will be arranged for this, usually one week after surgery. This depends on the position of the impacted canine and whether the operation is being carried out with local anaesthesia alone or with additional intravenous sedation. You should not feel any pain immediately after the operation as the area of surgery will be numb from the local anaesthetic. There may be swelling and bruising in the area of surgery, as well as some discomfort. Bruising is usually at its most obvious two to three days after surgery and varies between patients. It normally resolves itself after 10 to 14 days. Once the pack and stitches have been removed and the impacted tooth is exposed in the mouth, healing usually progresses quite quickly. We advise that a review appointment is arranged with your orthodontist a week to 10 days after your operation. This depends on your occupation and how you are after your treatment. It may be possible for you to return to work the next day. After your surgery, we will give you an information sheet with instructions to help bring about a quick recovery.